I'm back from a quick trip to California for work. This trip reminded me again of how much fun it is to fly. Don't get me wrong - the process of actually getting on the plane is awful and getting worse. But it can be made bearable by checking in online, packing light and smart, and carrying on. Another thing that always amazes me when I fly is how BIG this country is, and how beautiful it is. There is nothing like a bird's eye view to remind us of the glory of the earth. Wayne and Amy 1956, originally uploaded by AmyEmilia. We both look so young! 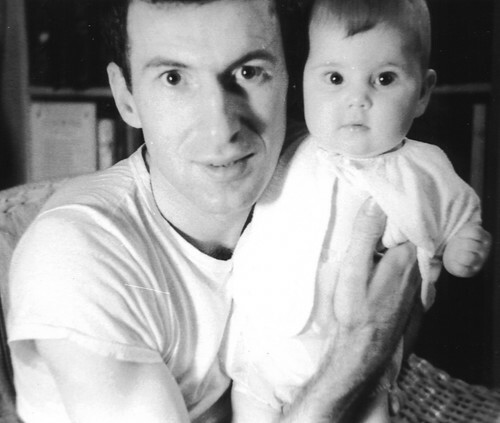 Dad was still in medical school, and I was maybe 6 months old? Not sure. My mom took the picture. She told me that at one time, they had $0.13 in the bank. But they never skimped on photos - there are quite a few that have survived the years so I suppose there were even more. My dad... well... what can anyone really say about their dad? Dedicated, hard-working, smart, tells a great story, kind, funny, quietly courageous, and humble. Known world-wide for his scientific endeavors (although you wouldn't hear it from him). Speaks French fluently, and I'm sure his Kikongo, Swahili, Lingala, and German would brush right up with some use. Even in his retirement he still works to better the lives of those suffering from tropical diseases. Together with my mom, he has raised 4 kids who all managed to succeed in their various ways. I feel so lucky to be their daughter. Thanks Dad and Mom! Alessandria is a lovely city, with a very long history (founded on a "pre-existing urban nucleus" in 1168 according to Wikipedia). I have found it to be friendly and low-key, a quiet place without many tourists. The photo was taken from my sister-in-law's balcony, and it shows a bit of the natural beauty to be found there as well. 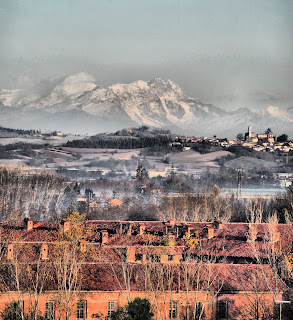 In 2003 I was visiting Alessandria (and Italy) for the very first time. We parked in the piazza across from my mother-in-law's apartment, just as we had done a few times before that week. But little did we know, it was Tuesday night, and Wednesday morning was Market Day. Of course we parked about 3 spaces inside the forbidden zone but we weren't paying attention. In the morning, there is NO CAR. NO CAR at all. Just masses of people and trailers and booths. My husband was speechless. We trundled off to where the police station USED to be when he was a child - then were directed back across town to the other police station. Since I was the official renter and driver, I had to be the one to deal with the car. And he said I had a better chance with them as an American tourist than he did as a pissed off former citizen. As we walked he tried to teach me some of what I needed to say, but it was useless. My traumatized brain remembered niente. I walked into the police station alone (he said he would be arrested if he tried, he was so angry) and found the right place to ask. All I could do was hold up my rental car keys and say "machina, GONE!" with mournful emphasis. The guy behind the desk realized he needed help. Two women from somewhere else in the station began to try and explain things. Then another customer came and helped. Finally, an off-duty policeman who spoke some limited English chimed in. We managed between us to establish that the car was indeed towed. Also that there was a fine - 100 euros I think. After some discussion among my team of helpers, they apparently agreed to waive the fine. They called and asked the towing place to waive the fee but that could not be arranged. I think it was 65 euros. To me this was totally fair and I agreed and thanked them. Now of course I have the problem that I need to get to the car, and have NO IDEA how to follow directions. My husband is still wisely staying out of sight and I get the feeling that I'm better off without him at this point. The off-duty policeman volunteers to take me to the towing place and unbelievable as it sounds, I hopped right in the car with him. Something I probably wouldn't do in the US! I asked him if there was an ATM since I didn't have the cash, and of course the first ATM we stopped at wasn't working. So in his police car we drive the wrong way up a one-way street, blocking the doorway to the bank - and he waits for me while I go in and get incredibly hosed on the exchange rate but come out with enough cash. Then we are off to the towing yard where there is much smiling and cheerful buongiorno-ing as I pay my towing fee (reduced to 50 euros!). And we have to have a few espressos together with the staff while the lowest guy on the totem pole goes to extract the car. Then my policeman kindly leads me out of the mess, offers to buy me lunch (which I politely decline) and in only three hours that adventure is complete. My poor husband is very happy to see me when I pull up in the piazza. Ever since, we have been very careful about parking in an open space, and we always read the signs! From a fellow blogger, Cherrye, over at My Bella Vita... this little exercise, which is fun but definitely dragged me off task this evening... I did have a few issues with the mosaic from Big Huge Labs and had to create it twice. Interestingly the search produced different choices the second time, I guess because FlickrSearch defaults to "interestingness" and that changes every second or so. Big Huge Labs is a great place to fool around with photos so have some fun. 2. What is your favorite food? Ripe avocado... yum!!! 4. What is your favorite color? Green. This photo has so many shades! 5. Who is your celebrity crush? The immortal Sean Connery. 7. Dream vacation? Madagascar... one of these days. 9. What you want to be when you grow up? A photographer... but a bit less adventurous than this one! 10. What do you love most in life? Being in love. 12. Your flickr name. AmyEmilia This kaleidoscope is one of my favorite creations ever. And one blog... Tetrapod Zoology. These reading materials would obviously not easily fit in any carry-on bag, or briefcase, much less a purse. And yet I can read any of them anytime I want, just by pulling it out of my purse. 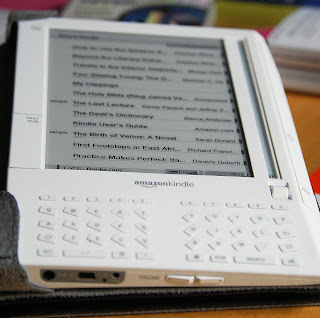 The Kindle is convenient, easy to read, and conserves paper. It gives me access to the reading materials I prefer. I think it fits very well into A Normal Life! What do you think? Is the Kindle worth buying? Would you use it?